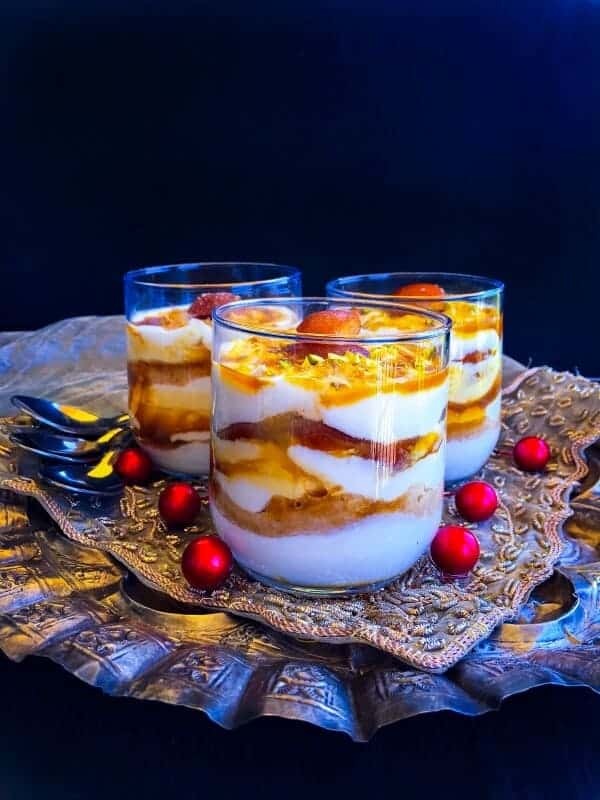 Gulab Jamun Dessert Parfait (Light Indian Dessert): A luscious, healthy Indian Diwali dessert recipe made using gulab jamun, yogurt, cream and lots of love. 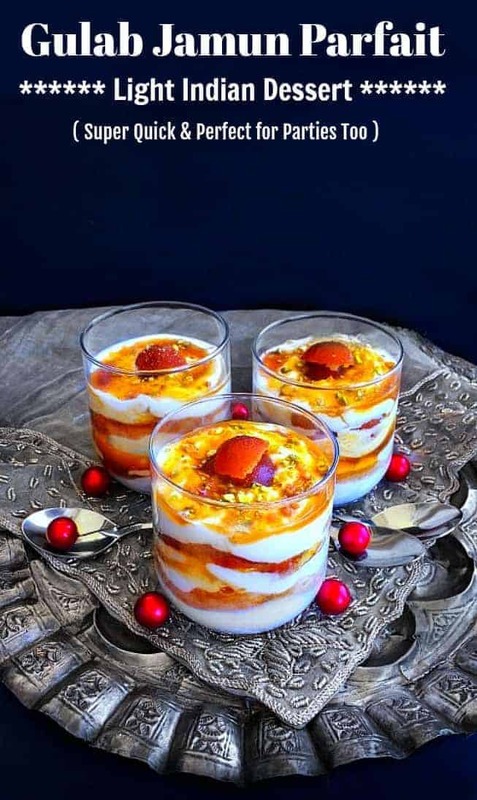 The Gulab Jamun Parfait can be made a day in advance and kept in the fridge. 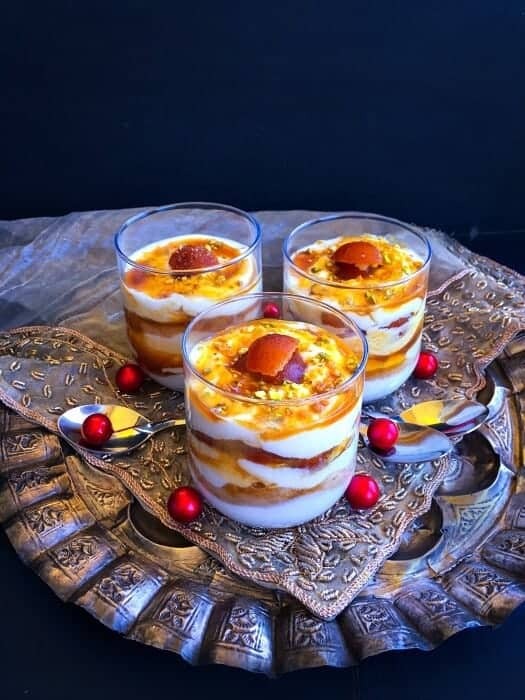 This Gulab Jamun Dessert Parfait is a Must for your celebrations!!! Hey Everyone, hope you had a great weekend and can you believe that we are just 2 weeks away from ‘Diwali’ – the Indian festival of lights & also one of the biggest Indian festival. It’s all about decorating your house and surroundings with colorful festive lights/candles/earthen pots. 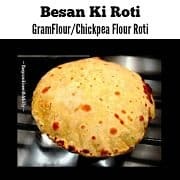 Then we have tons of food, especially sweets along with other festive Indian food like Biryani’s, Kachori, Curries, etc. It’s one gala time and you cannot avoid the avalanche of sweets that hit the Indian market during that time. 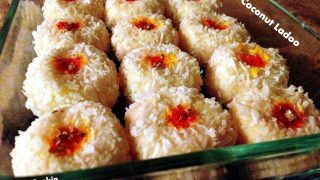 You’ll find sweets in different colors, texture and made with tons of ingredients packed in beautiful boxes. And there’s no way that you could avoid those sweets/desserts as they are seriously delicious and highly addictive! 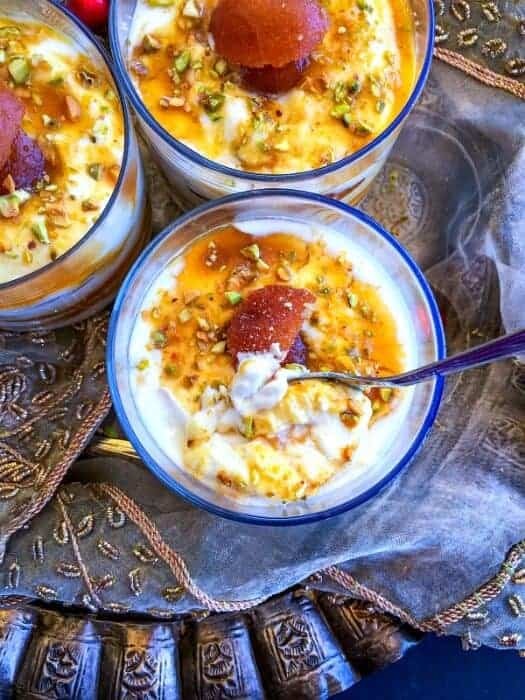 So to celebrate the occasion and keeping it light n quick, I’m making these Gulab Jamun Dessert Parfait. 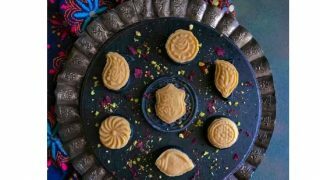 Which I also call my Healthy Indian Diwali Sweets recipe as it’s light and you can definitely have that extra helping. 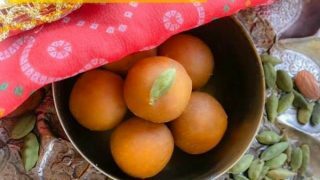 I absolutely LOOOOVE Gulab Jamuns which are round sweet dumplings made using ‘paneer/chena’, also known as cottage cheese. 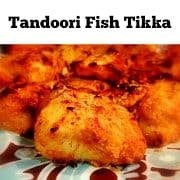 The dumplings are fried and soaked in a sugary syrup laden with saffron and cardamom mix. So, Gulab Jamun is extremely popular in and outside India and are available in almost every Indian restaurant (worldwide). 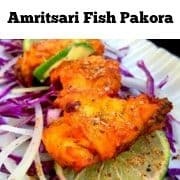 It’s so popular, that it’s also the MOST sold sweet outside of India. So, instead of serving Gulab Jamun the traditional way, I’m taking it a notch higher and serving it in a parfait. The parfait gives it this new, refreshing and luscious feel in every bite and ready in 15 minutes (makes 8 cups). 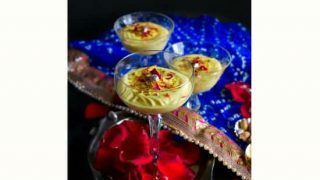 Since it’s a festive dessert, I’m adding pistachio, saffron, honey, and cream to my Gulab Jamun Dessert Parfait. 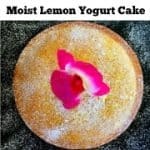 I’m adding cream with yogurt to make it smooth and extra creamy. However, you can skip the cream if need be and just make the whole parfait with Greek Yogurt. 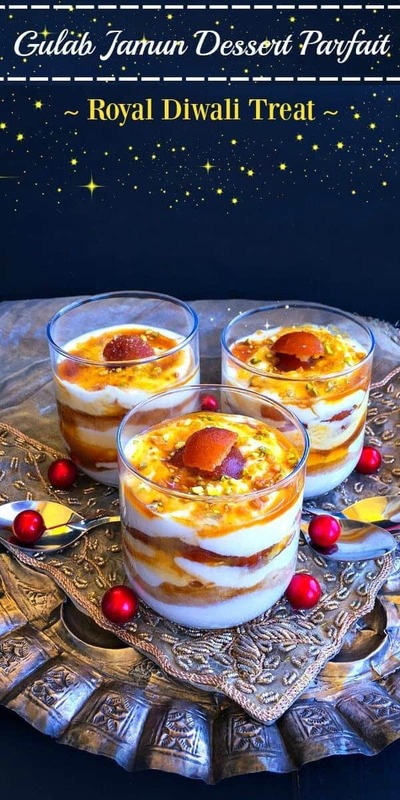 Just layer some gulab jamuns, nuts, saffron and decorate with some saffron-honey syrup on top and the Gulab Jamun Dessert Parfait is ready to be devoured!!! 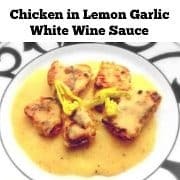 It’s so easy to make that you’d wonder why you haven’t tried it before and looks stunning too. 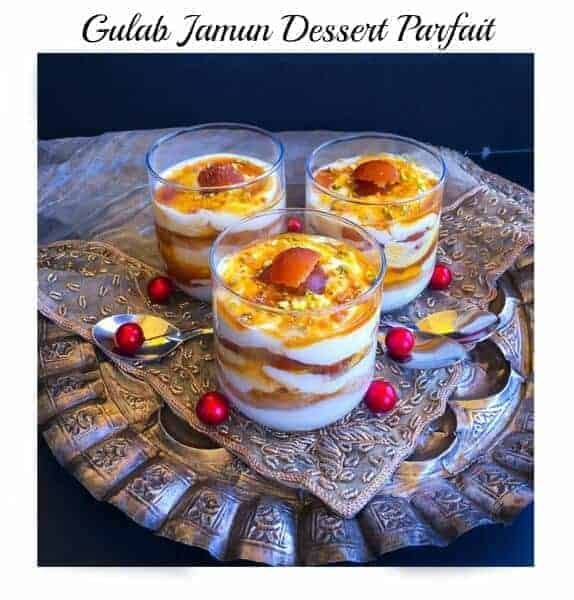 Gulab Jamun Dessert Parfait : A luscious yet healthy Indian dessert recipe made using gulab jamun, yogurt, cream and lots of love. Take 6 gulab jamuns and thinly slice them. Keep aside. Slice the other 6 gulab jamuns in quarter. In a large bowl, mix yogurt and cream together. 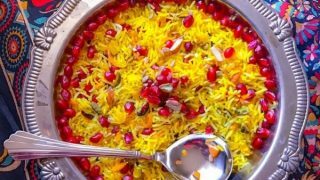 Heat milk in a pan, add water, saffron and bring to a boil. Stir the milk mixture and turn off the heat. Once the mixture is slightly cool, add honey, mix well and keep aside. Now, take a glass/serving bowl and add 2 tbsp yogurt mix. Place, 3-4 thinly sliced gulab jamuns (in a circle, covering all sides) and spread 1 tbsp yogurt mix over it. Spread 1/2 tsp saffron mix and add 2 tbsp yogurt mix. 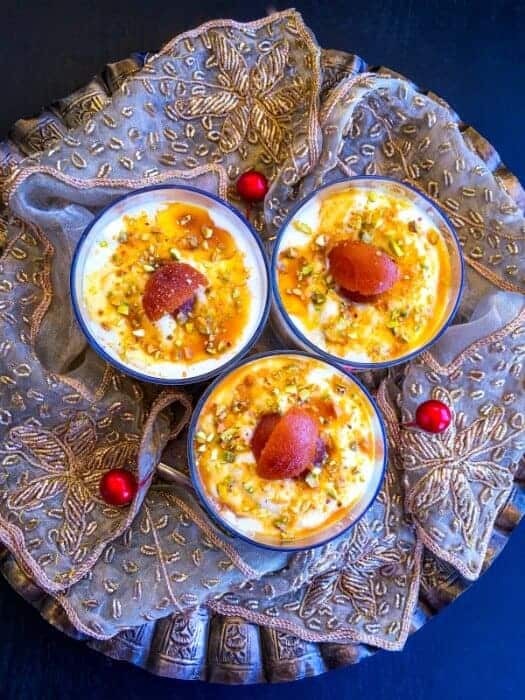 Decorate top with 1-2 quarter gulab jamuns, saffron mix and pistachio. Complete all the serving glasses similarly. Once the parfait are made, place all the glasses in fridge (for atleast 30 minutes). 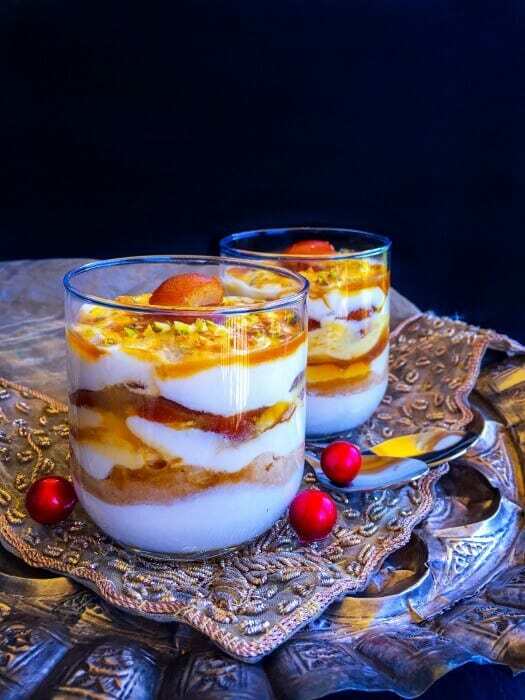 This Festive Season, give these Gulab Jamun Dessert Parfait a try and enjoy with your loved ones. 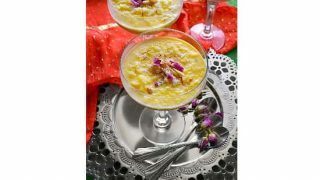 5 Replies to "Gulab Jamun Dessert Parfait (Light Indian Dessert) #gulabjamun"
Only yogurt can be used ?